Mary Blair created a lot of things. Disney's "Small World" is just one example. She illustrated children's books (Golden), did some pretty cute advertising work, and is known for her work with Disney visualizing many of the classic animated movies as well as creating the palettes that really define the early Disney animations. 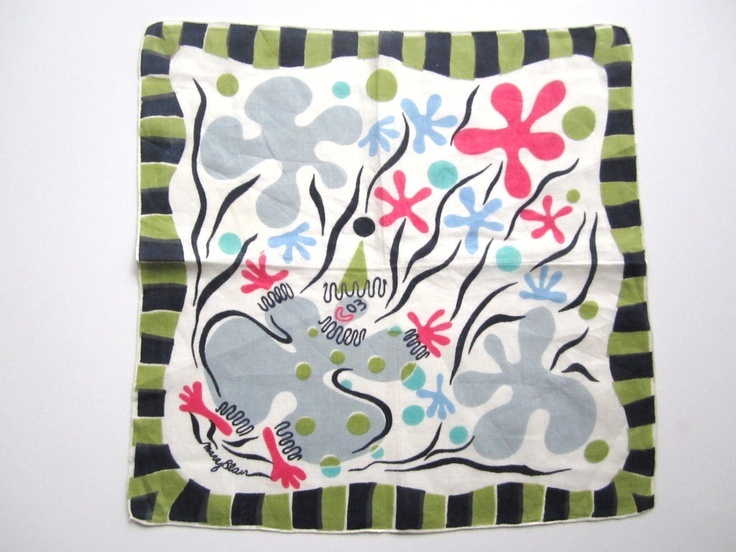 Is Mary Blair known for her hankie designs? I don't think so...but she should be as she brings a whimsy and yet a strong hand and strong common composition to the hankies that are out there. And, do you think they are valuable? One person noted she bought a Blair hankie at a yardsale for $.25 and proceeded to resell it on Ebay for in excess of $150. More>> That is even better than Apple stock! Here are a few examples I have gleaned from the web for your amusement and my reference.